Lat: 21.48° N Lon: 158.03° W Elev: 837 ft.
Breezy. Partly sunny with scattered showers in the morning, then mostly sunny with isolated showers in the afternoon. Highs 76 to 84. East winds 10 to 20 mph. Chance of rain 50 percent. Partly cloudy in the evening then becoming mostly cloudy. Breezy. Scattered showers. Lows around 67. East winds 10 to 20 mph. Chance of rain 50 percent. Mostly sunny. Breezy. Scattered showers in the morning, then isolated showers in the afternoon. Highs 75 to 83. East winds 10 to 20 mph. Chance of rain 50 percent. Partly cloudy in the evening then becoming mostly cloudy. Breezy. Scattered showers. Lows around 66. Northeast winds 15 to 20 mph. Chance of rain 50 percent. Mostly sunny. Breezy. Scattered showers in the morning, then isolated showers in the afternoon. Highs 75 to 83. East winds 15 to 20 mph. Chance of rain 50 percent. Partly cloudy in the evening then becoming mostly cloudy. Breezy. Scattered showers. Lows around 66. East winds 15 to 20 mph. Chance of rain 50 percent. Partly cloudy with scattered showers. Lows around 66. East winds 10 to 15 mph. Chance of rain 50 percent. Mostly sunny with scattered showers. Highs 75 to 83. East winds 10 to 15 mph. Chance of rain 50 percent. Partly cloudy with isolated showers. Lows around 64. East winds 10 to 15 mph. Chance of rain 20 percent. Mostly sunny with isolated showers in the morning, then mostly cloudy with scattered showers in the afternoon. Highs 74 to 82. East winds around 10 mph. Chance of rain 50 percent. Mostly cloudy with isolated showers. Lows around 63. 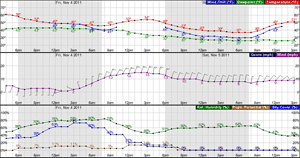 East winds around 10 mph in the evening becoming light. Chance of rain 20 percent. Partly sunny. Isolated showers in the morning, then scattered showers in the afternoon. Highs 74 to 82. Light winds. Chance of rain 50 percent.